The 73rd episode of Good Eats is all about tomatoes and different uses for them. Seeing that Ted is not a huge tomato fan, I was not sure what he would think of some of these applications, but worst case scenario would see me stocking up heavily on lycopene. Alton went over some tomato facts in the episode, stating that there are six types of tomatoes we can get commercially – globe, plum, cherry, pear, grape, and currant (in order of size from largest to smallest). A beefsteak tomato is a red globe tomato that is extra large in size. Oh, and never store tomatoes in the refrigerator, as temperatures colder than 50 degrees permanently stop a component of tomatoes that gives them flavor. For six servings of Alton’s stuffed tomatoes, cut the tops off of six large globe tomatoes, using a serrated knife. Scrape the seeds and pulp out of the tomato, using your fingers or a grapefruit spoon. The tops cut off of the globe tomatoes. Sprinkle the tomatoes liberally with Kosher salt and invert them on a rack for 15 minutes; this will remove excess moisture from the tomato shells. Seeded/cleaned tomato shells, salted liberally. Seeded/cleaned tomato shells, salted liberally and inverted. While the tomatoes drain, combine 2 C sauvignon blanc and 1 C hot water; add 3 C dried mushrooms to the liquid mixture to rehydrate. Sauvignon blanc to rehydrate dried mushrooms. Dried shiitake mushrooms for the filling. Dried shiitakes, rehydrating in water and sauvignon blanc. While Alton used a blend of chanterelles, morels, and shiitakes, I only used shiitakes. 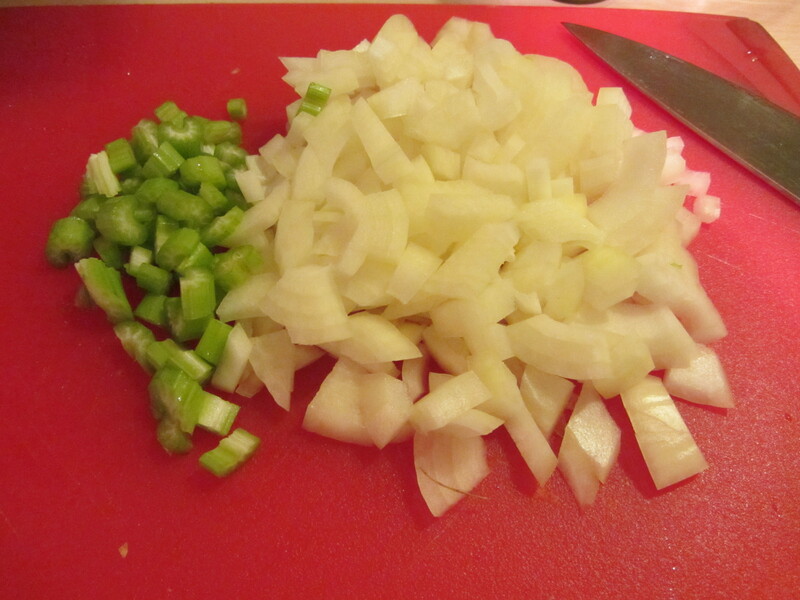 Next, heat a large skillet, adding 2 T olive oil, 1 T minced garlic, 2 T minced shallots, and 1 C finely diced onion. Cook the onion until translucent. 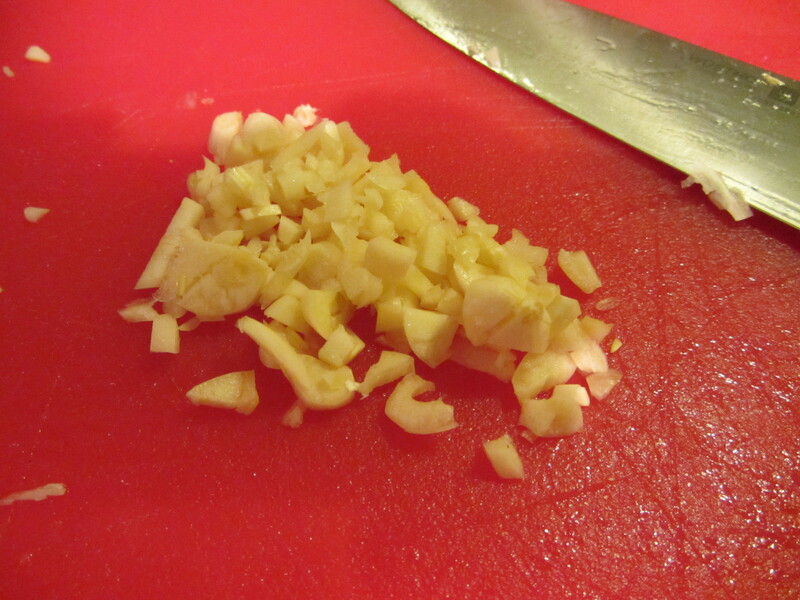 Garlic, shallots, and onion, cooking in olive oil. Using your hands, squeeze excess moisture from the hydrated mushrooms, reserving the liquid. Chop the mushrooms and add them to the pan, cooking for five minutes over medium heat. The rehydrated shiitake mushrooms, squeezed out and ready to be chopped. Chopped shiitakes added to skillet. Add a cup of your reserved mushroom liquid to the pan and bring it to a simmer for five minutes. 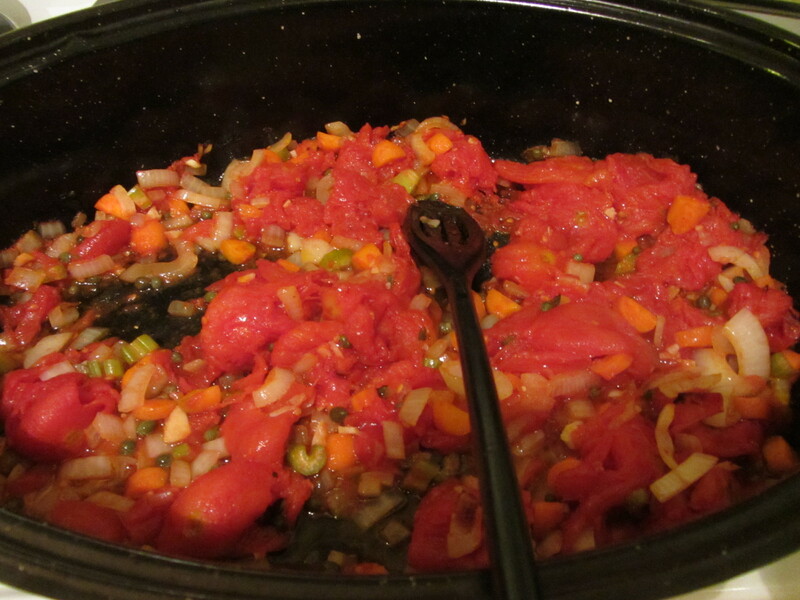 Follow this up with 1/4 t pepper and 1 chopped tomato. Finally, add 1 1/4 C panko breadcrumbs. Reserved hydrating liquid added to skillet. Pepper and chopped tomato into the pan. Panko breadcrumbs mixed into the filling. By this time, your tomato shells should have shed any excess moisture and you can use a measuring cup to fill the shells with the mushroom mixture. 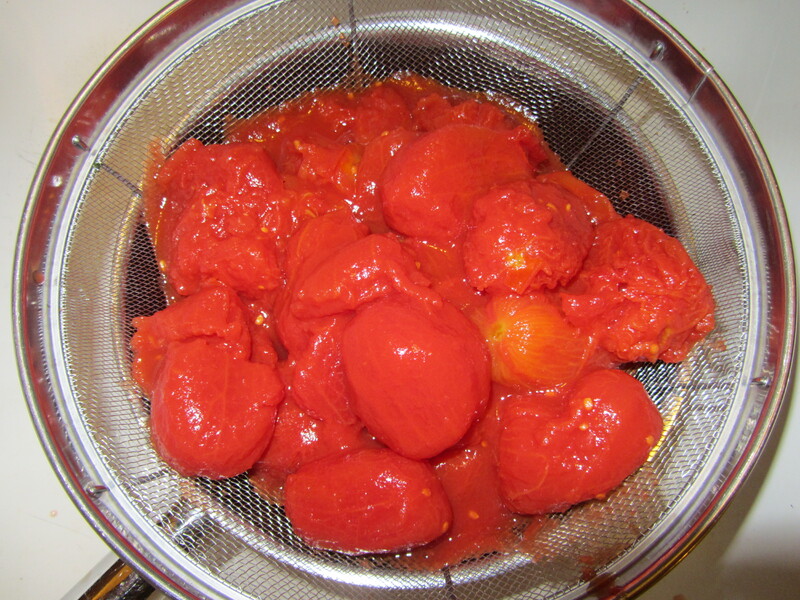 Tomato shells after draining for 15 minutes. The completed filling mixture for stuffed tomatoes. Tomato shells stuffed with mushroom filling. For a final topping, combine 3 1/2 ounces of goat cheese with 1 T parsley, dividing this mixture evenly among the tomatoes. Place the stuffed tomatoes under a preheated broiler for 5-7 minutes, and enjoy! Goat cheese and parsley to combine for the topping. Goat cheese mixture to top the stuffed tomatoes. We ate Alton’s stuffed tomatoes as a side dish to my mom’s hearty minestrone soup. Stuffed tomatoes alongside hearty minestrone soup. Ted thought this recipe was just OK, as he didn’t care for the tomato shells. As a tomato fan, however, I thought Alton’s stuffed tomatoes were delicious. The tomato shells maintained their texture and were far from soggy, contributing a bright tomato flavor. The mushroom filling had a fantastic umami flavor and slightly crunchy texture, and, well, who doesn’t like goat cheese? This recipe is a great blend of textures and flavors, and could be served as a vegetable side dish or as a vegetarian entree. I was curious to see how this episode’s tomato sauce would compare to Alton’s canned tomato sauce that I made over two years ago when I was writing up the second season of Good Eats. This episode is all about using fresh tomatoes, and this recipe calls for 20 fresh Roma tomatoes. 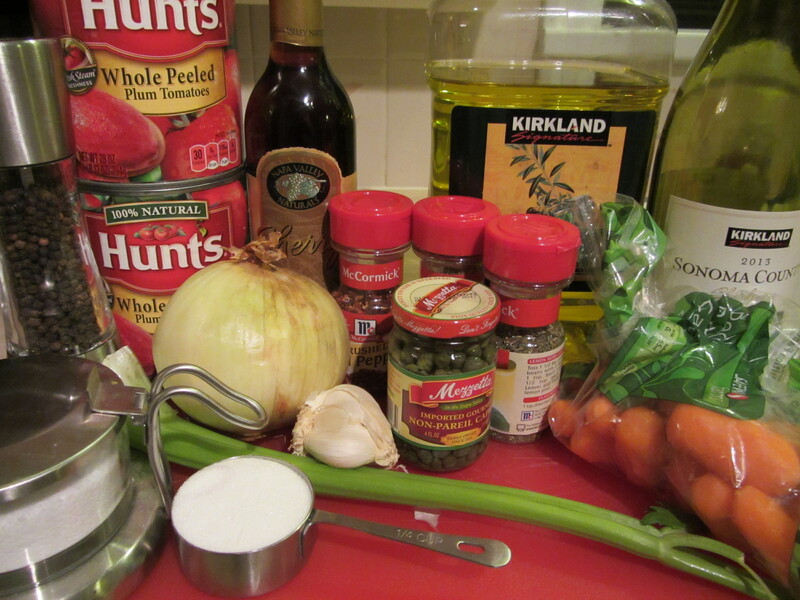 In addition, you’ll need olive oil, fresh thyme, fresh oregano, Kosher salt, pepper, garlic, and onion. Garlic, onion, oregano, and thyme. Begin by halving/seeding the Roma tomatoes, placing them cut side up in two 13×9-inch glass baking dishes. 20 Roma tomatoes, halved and seeded. Spritz (or, in my case, drizzle) the tomatoes with olive oil, and sprinkle them evenly with 1 T each of chopped fresh thyme and oregano. Alternatively, you can use 2 t of each herb, dried. Tomatoes, drizzled with olive oil and sprinkled with oregano and thyme. Sprinkle Kosher salt and 1/2 t black pepper over the tomatoes, along with 2 t minced garlic and 1 C finely diced onion (any type will work). 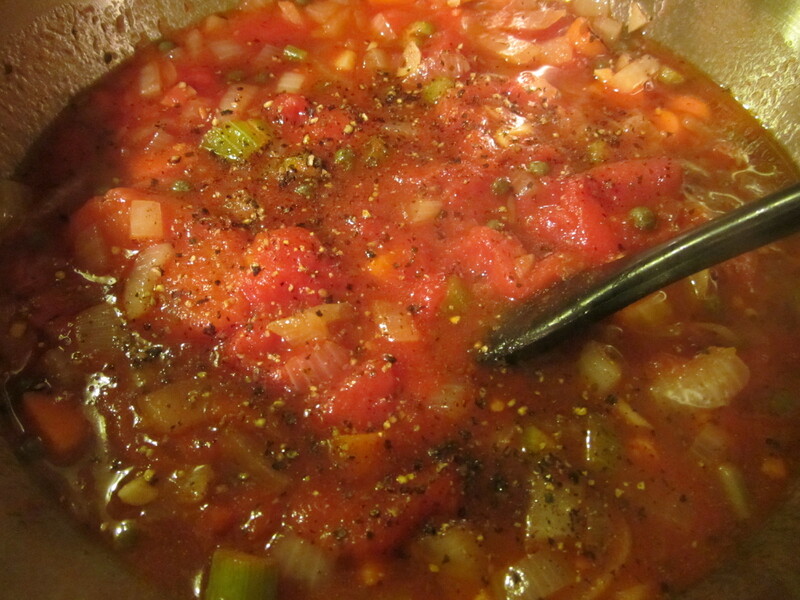 Kosher salt, pepper, garlic, and onion added to tomatoes. 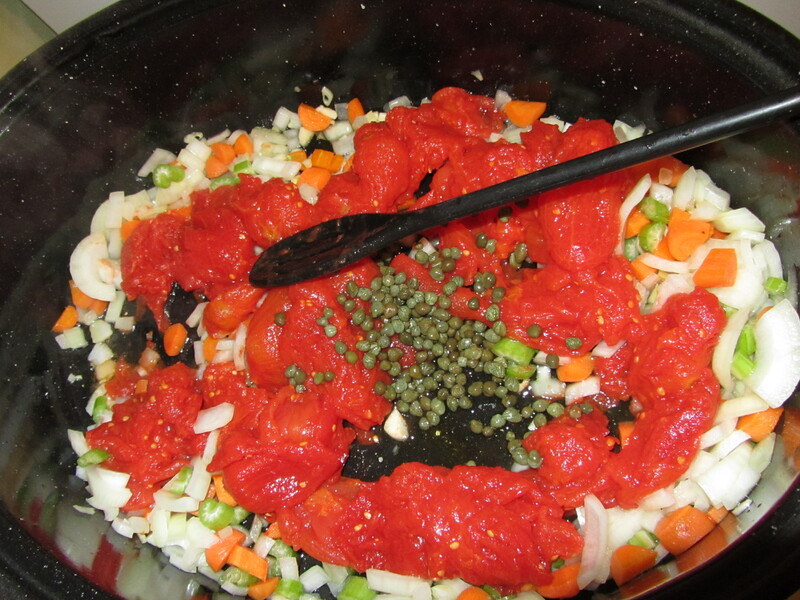 Stick the tomatoes into a 325-degree oven for two hours. Tomatoes after roasting for two hours. After two hours, increase the oven’s temperature to 400 degrees for an additional half hour. Tomatoes after roasting for an additional half hour. 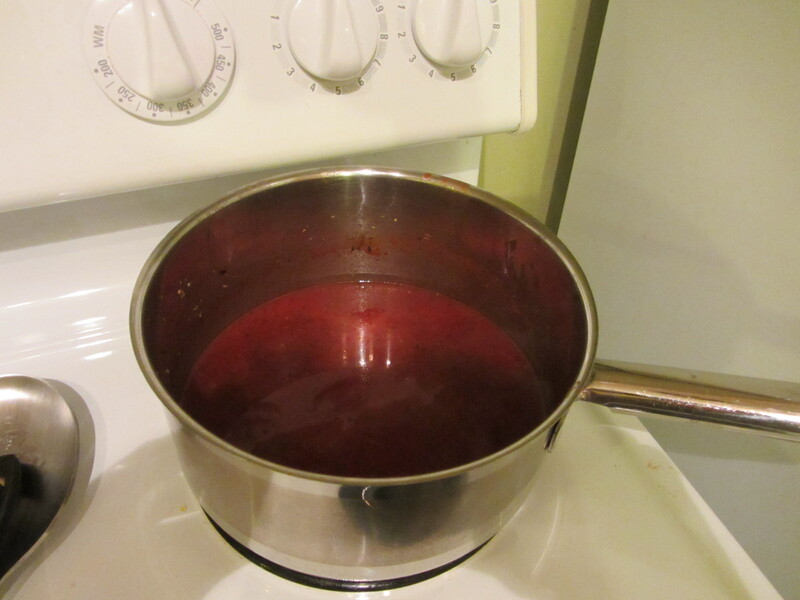 Remove the tomatoes from the oven and run them through a food mill (I have my mom’s ancient one that she used to use for applesauce) to get rid of their skins/seeds; you can do this directly over a medium saucepan. 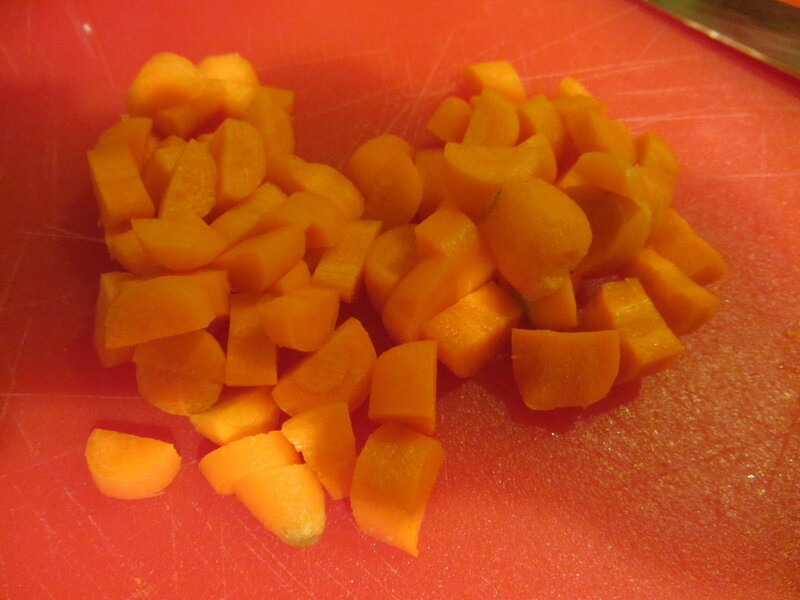 It will take a while to push them all through the food mill and you will get very little yield. Food mill placed over saucepan. Pressing tomatoes through food mill. 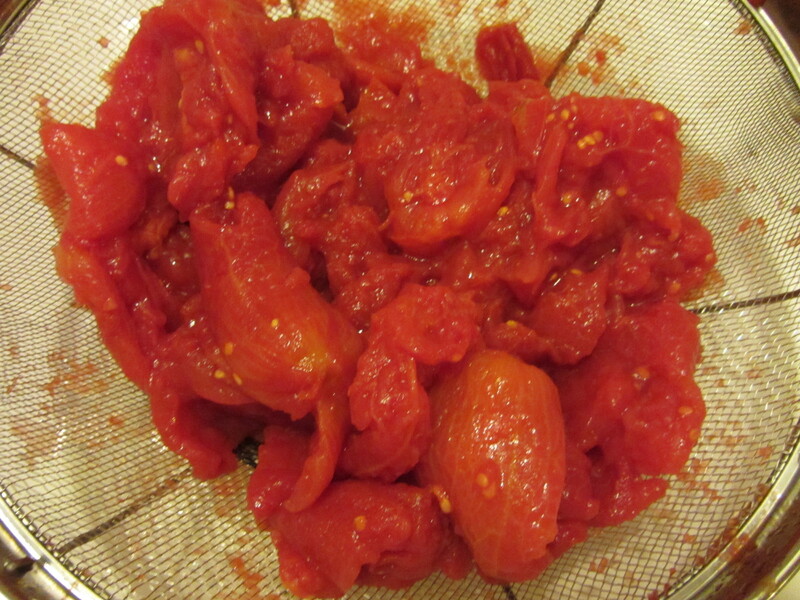 Tomato remains after going through food mill. The yield from my tomatoes. 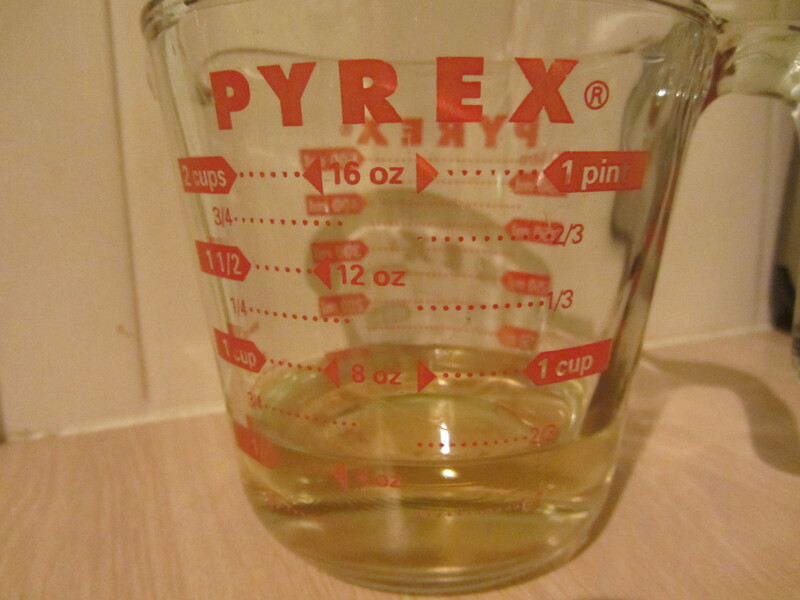 Add a cup of white wine (Alton used “cheap Chardonnay”) and bring the sauce to a boil over medium heat. 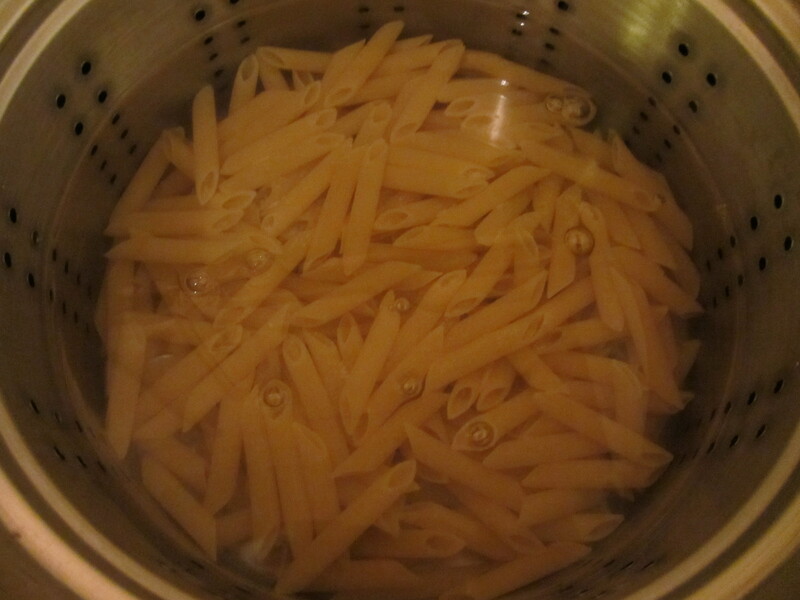 Once boiling, decrease the heat and simmer the sauce for five minutes. 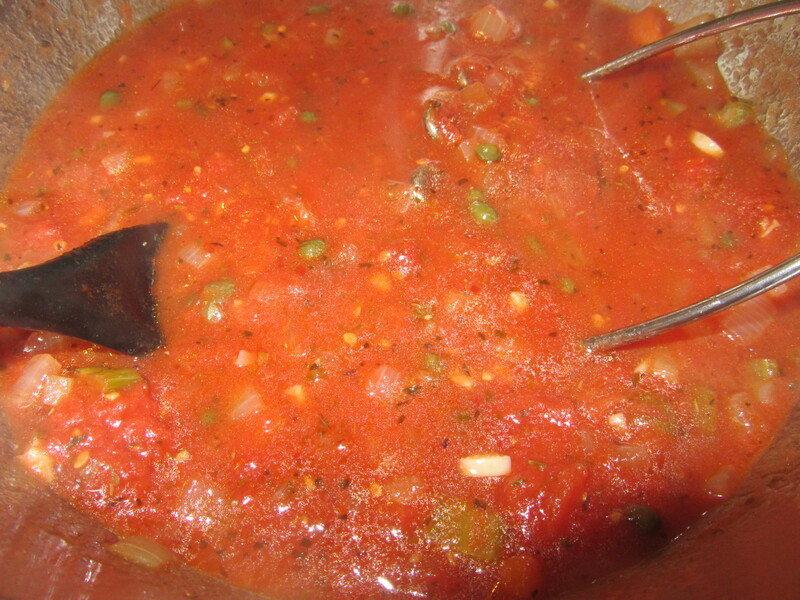 Chardonnay added to tomato paste. 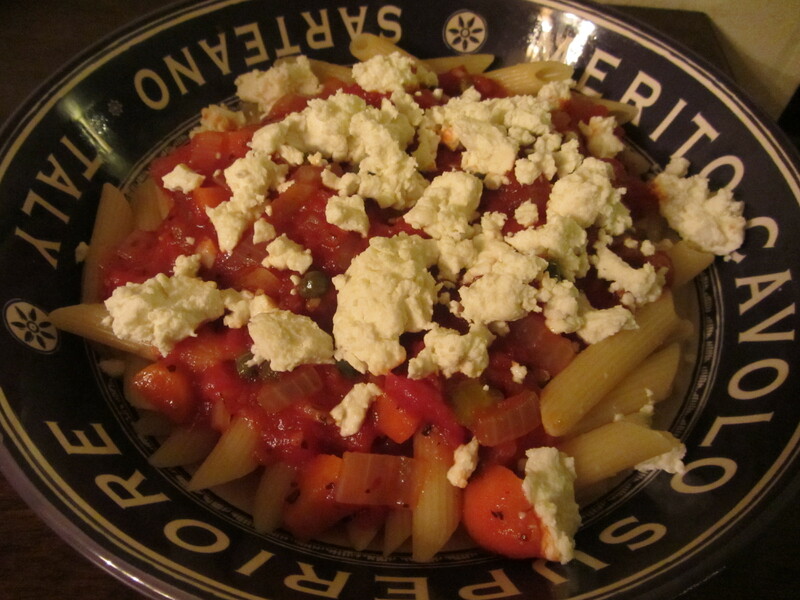 I served this tomato sauce over pasta, along with homemade lamb/beef meatballs (made by Ted) and Parmesan. 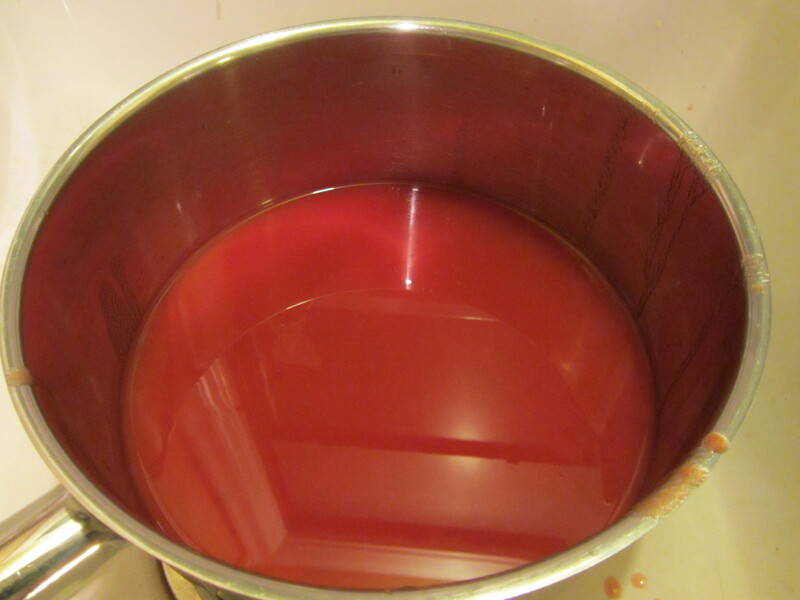 Alton’s completed tomato sauce. 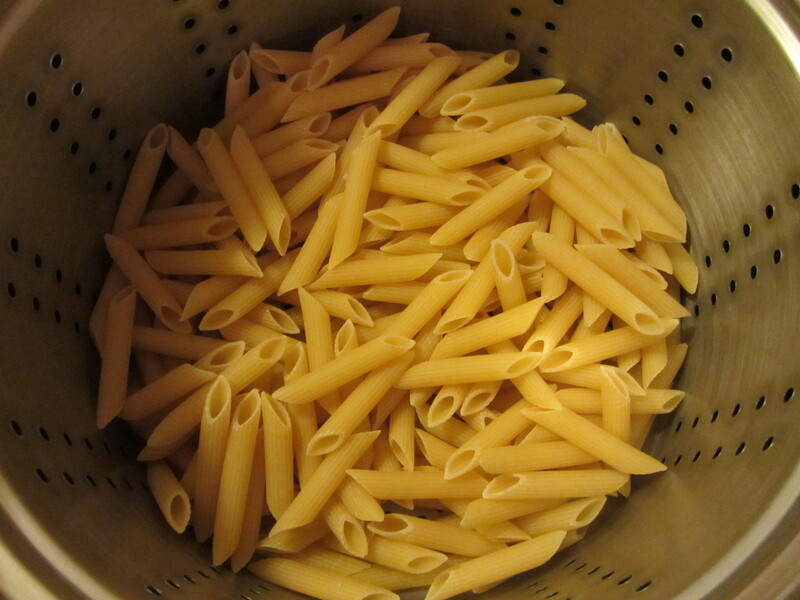 with pasta and meatballs. Honestly, I was disappointed in this sauce. 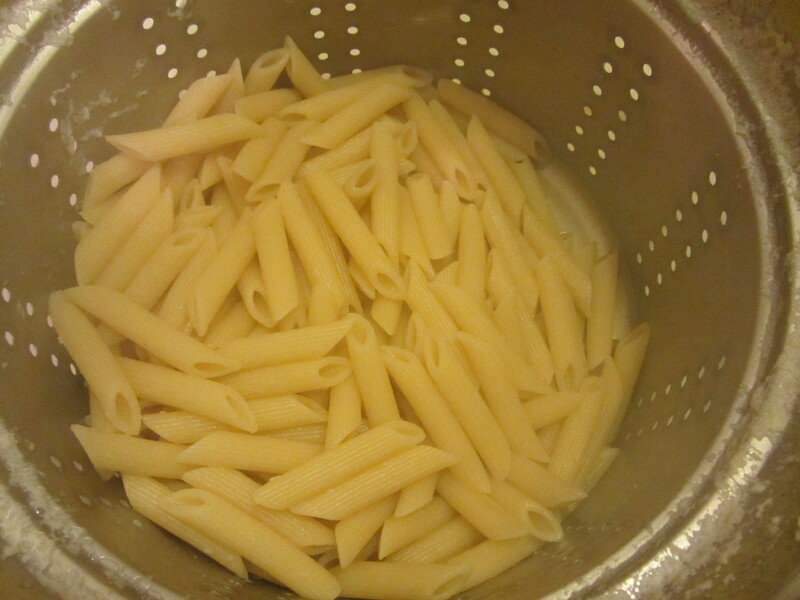 This recipe made just enough sauce for a pound of pasta, and it was nothing special. 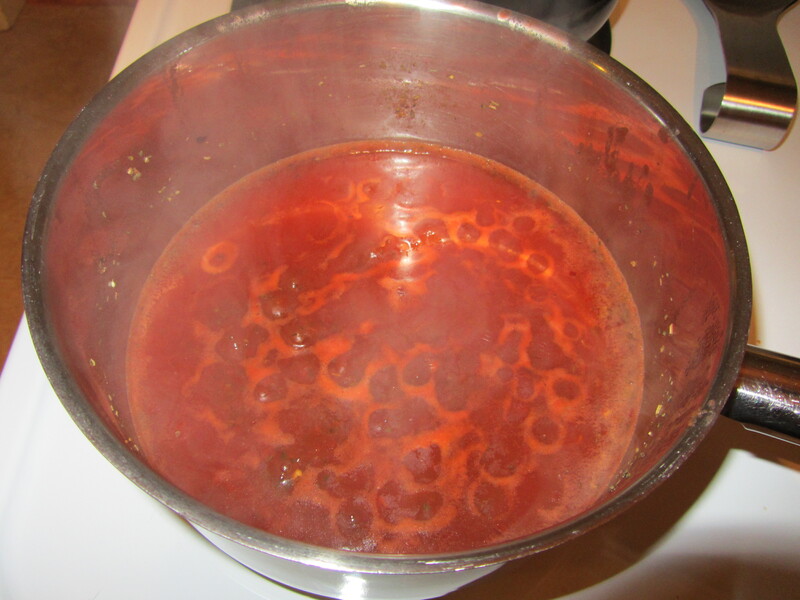 The wine flavor seemed too prominent for my taste, so I would simmer it longer, if I were to make this again… which I probably will not do. I expected to prefer this sauce over the one from season two, especially since this one uses fresh tomatoes, but I would choose Alton’s canned sauce any day. The final recipe from this episode is for a TBL (tomato/bacon/lettuce) panzanella salad. In the episode, Alton demonstrates that this panzanella is a great alternative to a BLT sandwich, and that it showcases tomatoes very well. I love a good panzanella, or a good BLT for that matter, so I was enthusiastic about this recipe. Beginning the night before you want to eat this panzanella, cut a quart of 1-inch high-quality bread cubes, placing them on a pan to dry overnight. A loaf of good quality bread. A loaf of good quality bread, cut into cubes. Bread cubes, left to dry overnight. The following day, cook six slices of bacon, saving the drippings. I used my bacon that I made from episode 59. Cut the bacon into 1-inch pieces and place them into a large bowl. 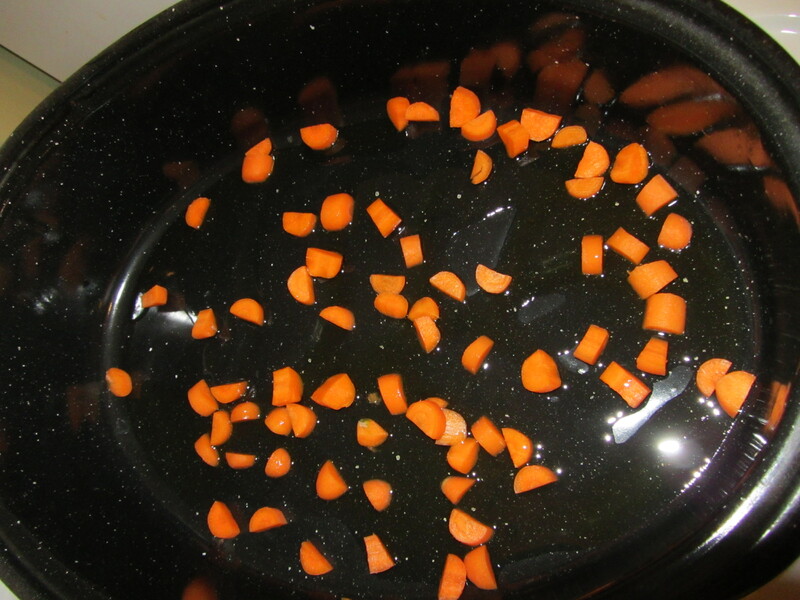 In a separate bowl, toss the dried bread cubes with the warm bacon drippings. Dried bread cubes tossed with bacon drippings. Next, sear 2 C of halved grape tomatoes in a hot pan, face down, for about five minutes. Add the seared tomatoes to the bacon bowl. Halved grape tomatoes, searing in a hot pan. Seared tomatoes added to chopped bacon. Halve 2 C of raw yellow pear tomatoes (I had to use yellow grape tomatoes), adding them to the bacon/tomato bowl. Next, add 2 C of chopped Romaine lettuce. Raw yellow tomatoes and chopped Romaine added to bacon and seared tomatoes. 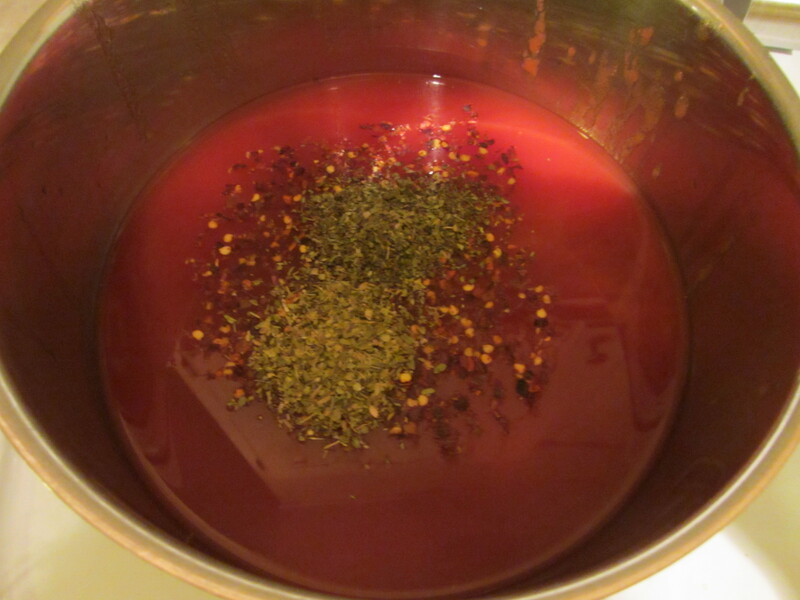 In a small lidded container, shake together 3 T olive oil, 1/4 C red wine vinegar, 1/4 t salt, and 1/4 t pepper. 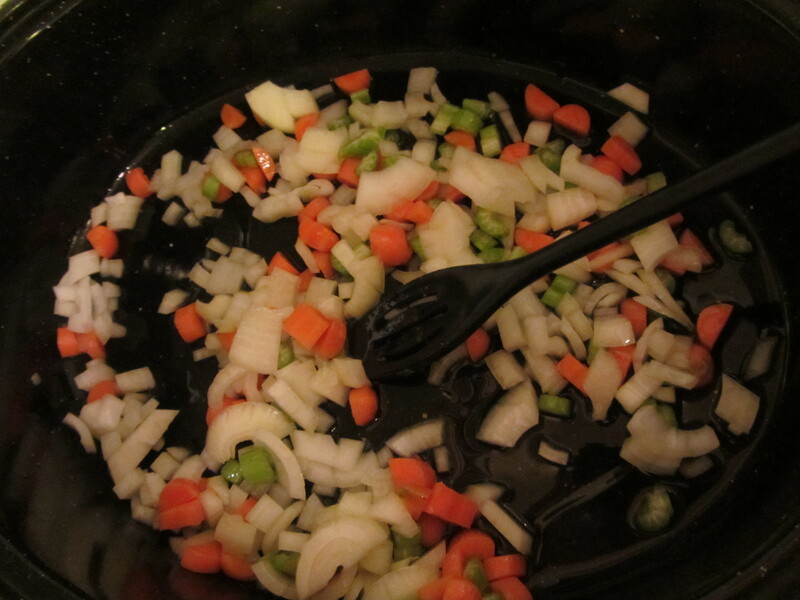 Olive oil, red wine vinegar, salt, and pepper for the dressing. Combine the bread cubes with the rest of the salad and drizzle on the dressing. Finish the salad off by adding a chiffonade of fresh basil and mint. Bread cubes added to salad. Chiffonade of basil and mint. Dressing drizzled over salad, and chiffonade of basil and mint added. A bowl of Alton’s panzanella. I thought this was a really good panzanella salad. The bread cubes stayed crunchy, the bacon added meatiness, and the tomatoes gave a super fresh flavor. I thought the vinegar-based dressing paired well also.This is also a very colorful, pretty salad. To me, this is more of a warm weather meal, but we enjoyed it nonetheless. I think this still had a few too many tomatoes for Ted’s taste, but I may make this again for myself and enjoy it on a sunny day on the deck.